That was the teaser headline, and it sure got the gang out of bed. However, the real job for them was to be sent shovelling! On Saturday your blogger was happily ensconced in his study writing the day's post when the door opened and, mid blog, Mrs. Blogger reminded him that there was a pressing social engagement that evening. Missing that would earn a frown, possibly even a stern tut. Oh-oh. The post therefore had to be parked, not to be resumed until the Sunday morning. A hot cup of tea, a doughnut, and some nice reading material. Go for it, Rick ! Enjoy. Oh, the anticipation of it. We split into two teams. One to Winchcombe with the Telehandler, sorting out second hand sleepers, the other to Broadway, to shovel ballast, and empty any passing ballast trains. Are you the low season train for Winchcombe by any chance? 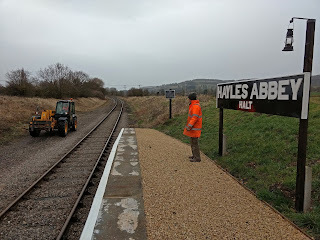 As we had half an hour to spare, we did a quick detour to Hayles Abbey Halt to measure up the platform bench there. 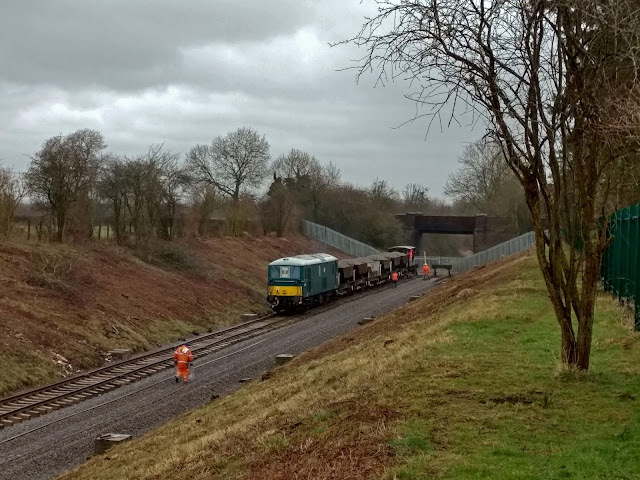 No passing trains today, but there was a passing Telehandler. In the future car park at Broadway contractors were taking away the spoil dug out from near the old signal box a few weeks back. 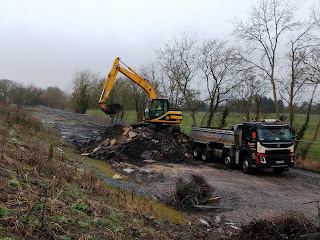 We are obliged to deliver up a clean site to the new owner. The spoil was once part of a raised platform by the former cattle dock, hence the chunks of concrete in it. Others were already at the station, and had a trolley out to collect the last of the PWay materials still left in the Broadway station area. 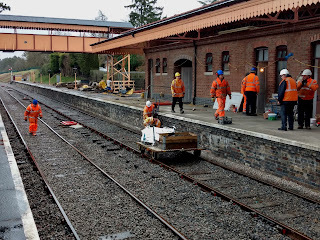 Meanwhile, in the station itself slabbing of the platform continued, as a radio recording was being made. Good PR for us. At 11 am the first ballast train appeared, fully loaded. It was reversed into platform 2, the up line. It reversed all the way down to the Honeybourne end buffer stop, where the Shark plough was wound down. A number of the shovelling gang joined the ballast train to help with discharging the Dogfish. 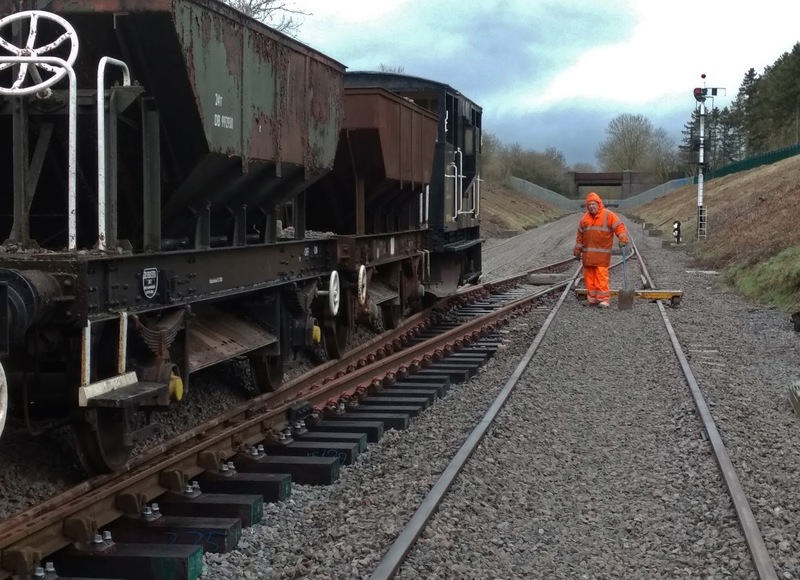 All of the wagons were selected for the drop, which was expected to bring the train near to the turnout. The Shark at the back ploughed the excess from the four foot into the outsides. 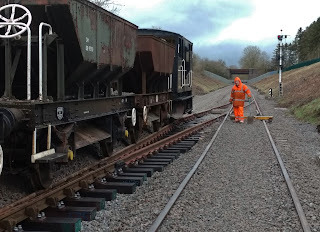 As the ballast train neared the inner home,the last of the wagons emptied. It looked like room for another two to take us up to the turnout. 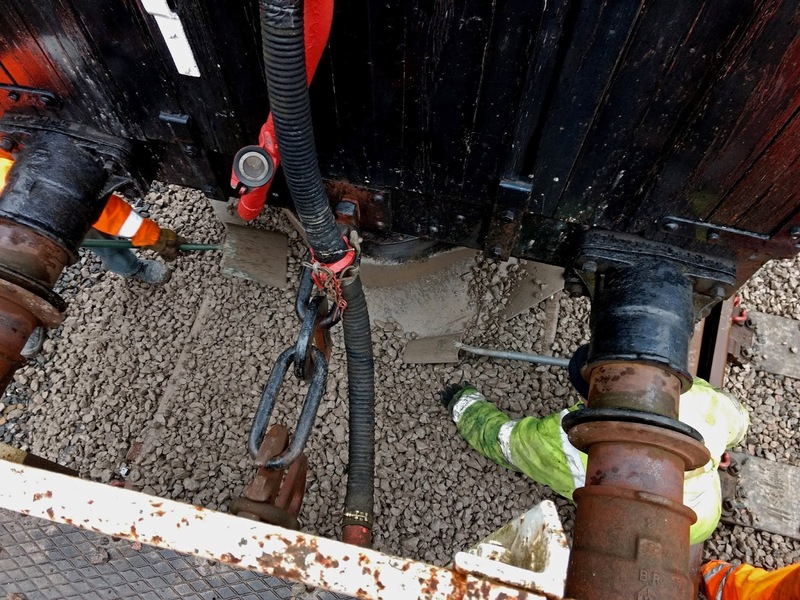 The drop being completed, the order was given to resume shovelling. And of course 6 others, to be fair. 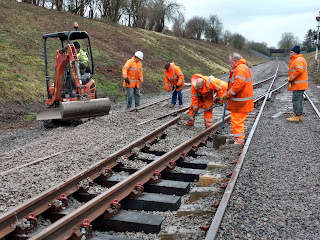 We shovelled our way through the platform, to make sure the sleeper ends were all provided with something for the tamper to work on, when it starts work here next Tuesday. After lunch the ballast train was back, once again reloaded. Here it is slowly reversing through the station, past the BROADWAY running in board. (A second one for P1 is in the course of manufacture in time for the opening day). 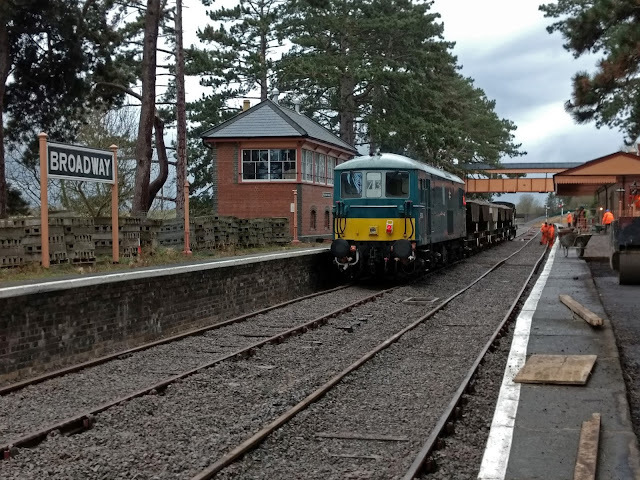 Another handsome picture for you, as the train reverses past the signal box. As the train reversed up to the turnout for the up siding, the ballast shovellers came back out of the woodwork and carried on. It was very windy today, with patchy drizzle, so this activity at least kept you warm. 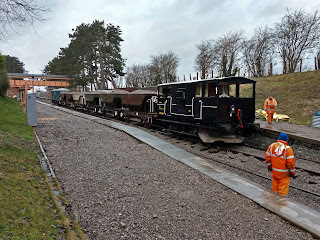 To fill in the last stretch of the siding up to the turnout, two more wagons were dropped, and then the plough under the Shark was lifted so that a third and final wagon load could be carefully dropped over the turnout, but without the plough. 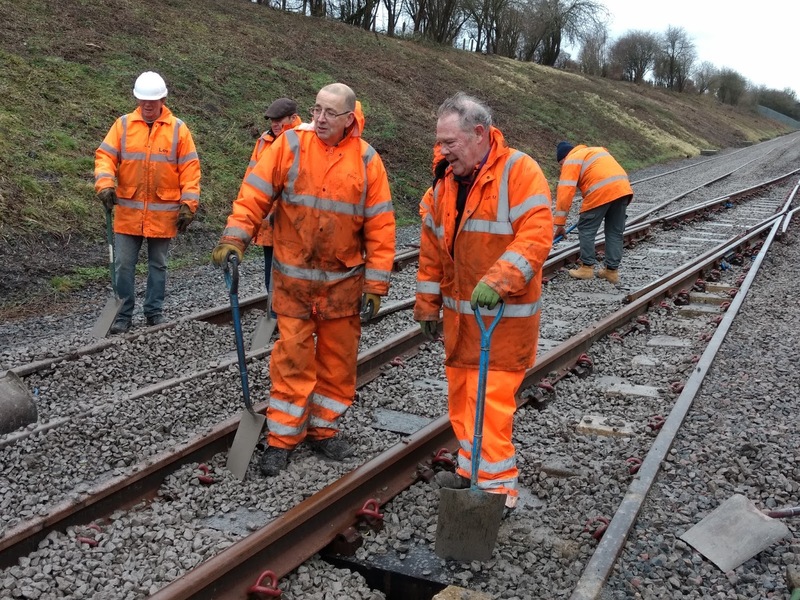 The turnout was to be ballasted by hand, with a little help from Steve's mini digger. 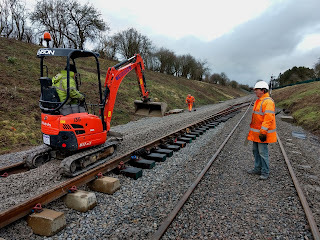 In the picture the plough blade is being dug out by hand, so that it can be lifted right up and secured for transport. 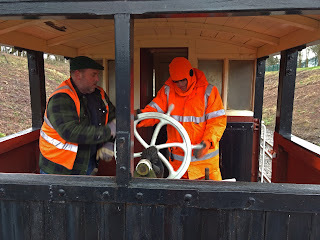 Lifting (and indeed dropping) the plough requires an interminable number of revolutions on the 'ship's wheel' here. Jonathan had a good go, but the going was hard because of all the ballast around the ploughshare, so Neil jumped up and gave him a hand. 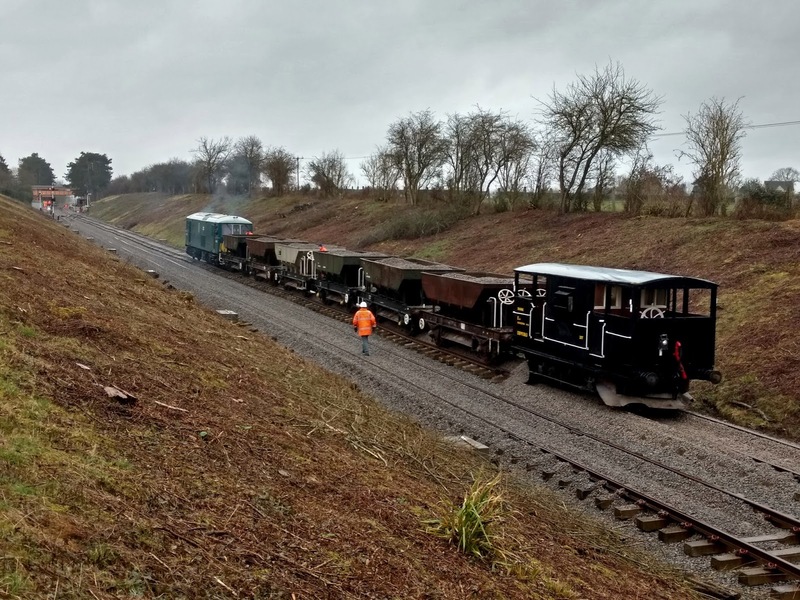 Then the last wagon was slowly discharged over the turnout, leaving just a long dyke of ballast in the middle, and nothing round the sides. The switches can just be made out on the right, showing that the train is just working off the turnout. You can see the section now which appears to be unballasted, but in fact the ballast for it is in the middle, under the train. We then drew our trump card - Steve! 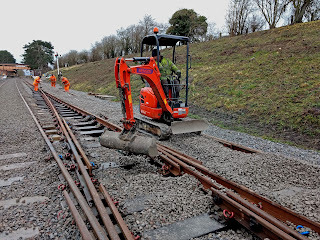 Go-Go Gadget Mini Digger. As you can see, the bucket of the mini digger is just about the same width as the four foot, and it was was an ideal tool to lift the ballast out and ladle it carefull this way and that into the voids on each side. The same job was being done by hand a bit further along. Steve's little bucket was just ideal for the job, and saved us a lot of manual labour, and time. 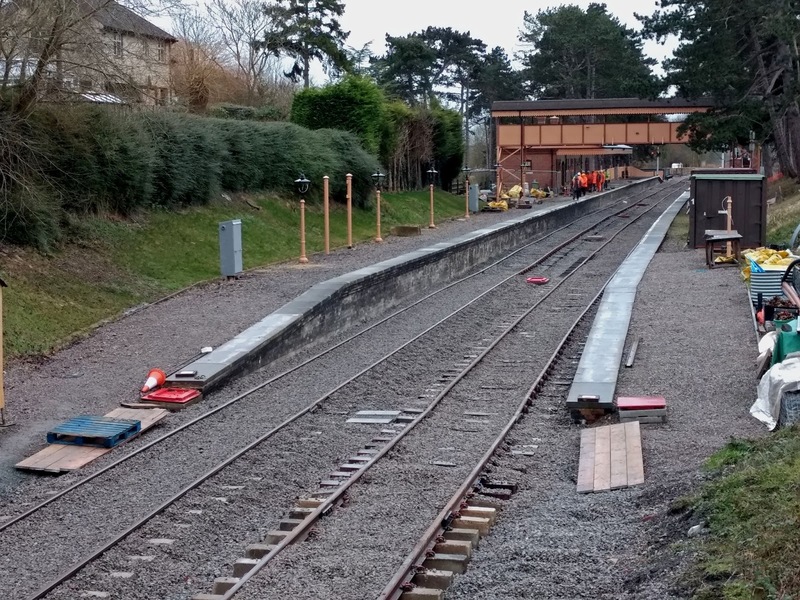 Soon the whole turnout was in ballast up to the tops of the sleepers. 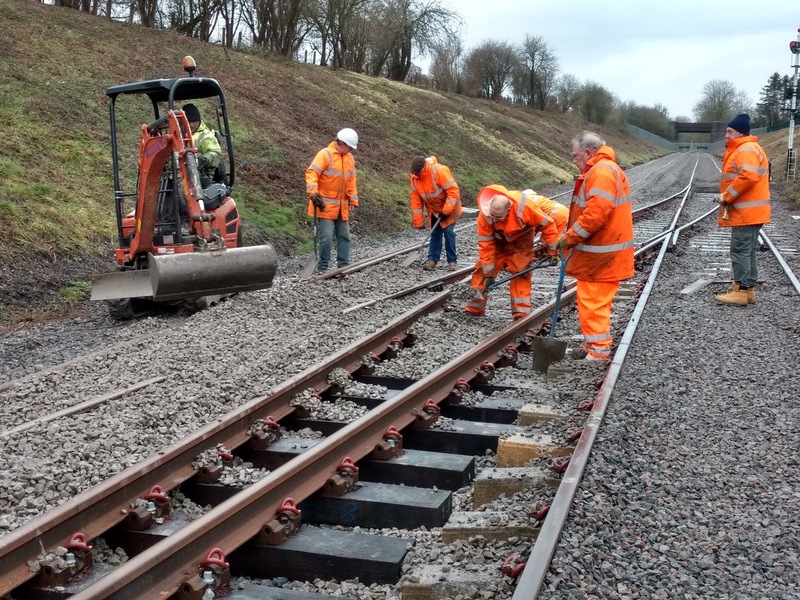 It just needed a tiny bit of shovel work to move the drops the last few inches, mostly into the voids still under the running rail. This shovelling was clearly a spectator sport, but you couldn't participate unless you had something to lean on. One dedicated member of the gang was thought to have fallen ill, as he seemed to be immobile, collapsed on the ground. 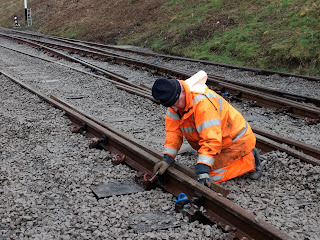 But no, it was Robert, carefully cleaning out the ballast dropped into various crevices where it shouldn't really be. That's handwork here. 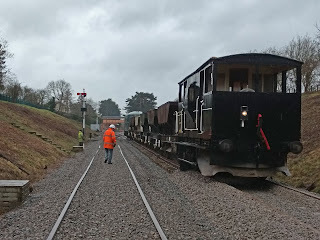 As the light began to fade you could see the successful ballast drop today on the left along the upside siding, while work in the foreground has almost completed the hand (-assisted) ballasting of the turnout. Looking the other way the ballast seems fairly evenly distributed between the platforms, with a bit more work required in the foreground on the right. Steve by now declared himself to be freezing cold. His little digger has no cab and while he is in the same rain as everyone else, Steve is motionless, while the rest of us are quite warm after all the vigorous shovelling we've been doing. Every cloud has a silver lining. Steve will be back to finish the job later in the week. On the way home we saw legs sticking out of the booking office doorway. It was Neal on his hands and knees, treating the newly laid tile floor to a coat of sealant. The shine was created by the natural daylight coming in from the other side. 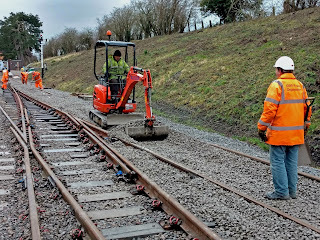 We will be relaying the track on to the bridge on Wednesday 28th February. 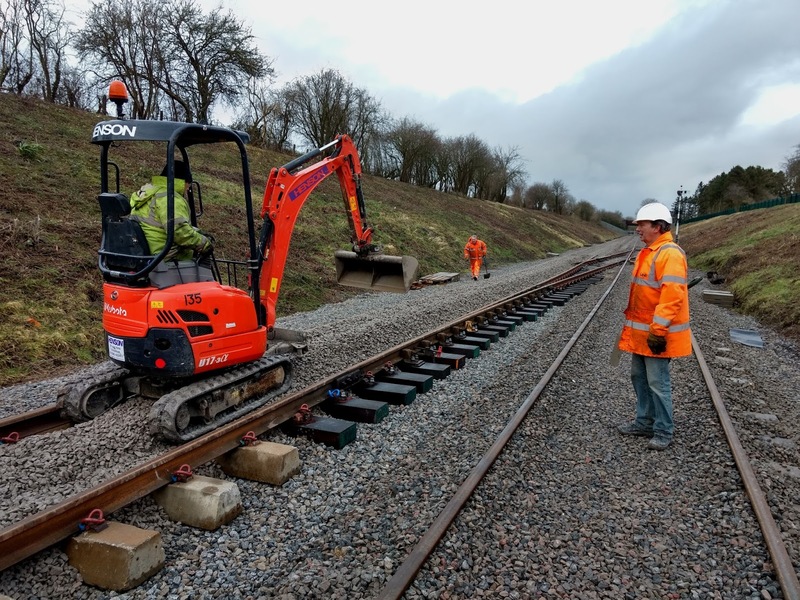 The tamper will start work on completing the Broadway extension on Tuesday 20th February. 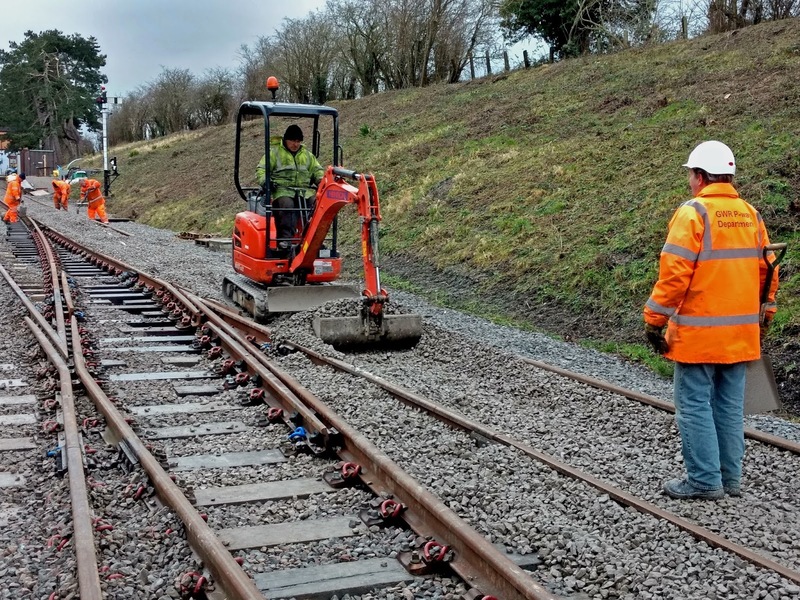 It will start a few yards north of Pry Lane and work its way northwards into Broadway station over several days. The regulator will follow on immediately afterwards. 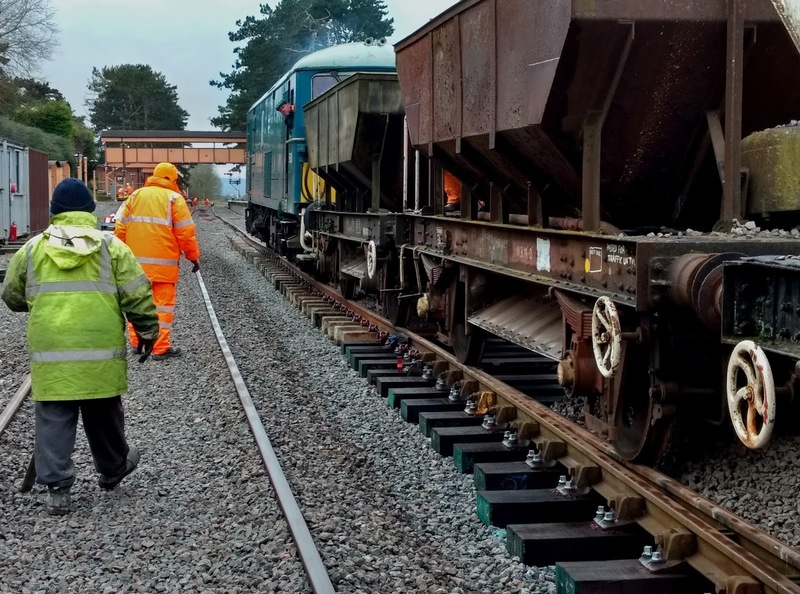 Excellent pictures of the ballast drop. How did you get to the buffer stops end that quickly to take the next shot? The Booking Hall is really looking too good to let people walk upon! Platform 1 looks so much more the part with the tops on the lamp posts. To coin a quote. "This is not going to be great. This is not going to be amazing. This is going to be Amazingly amazing!". 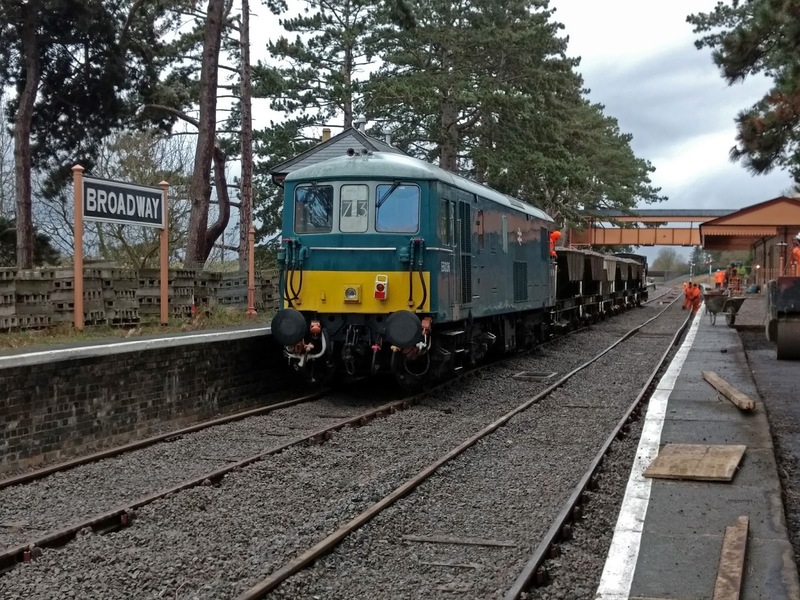 Many thanks to Jo for another wonderful post, including, I think, one of his best shots of my favourite diesel (well, electro diesel), the class 73. It really is very handsome, don't you think ? I was going to make a remark about the Booking Office floor, but I see St. Blazey has got in before me. All I can say about his comment is, I totally agree with everything he says. They're not really going to let the general public walk on that floor, are they ? Good heavens. Well done with the ballast drop. So, once it has been tamped, that will be it, will it ? 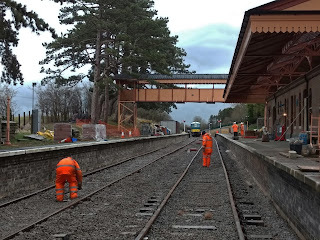 I see S&T have been busy, installing the ground frame et al. Good luck with everything else. I remember a castle in France where all visitors had to change into slippers to avoid scratching the parquet floor. 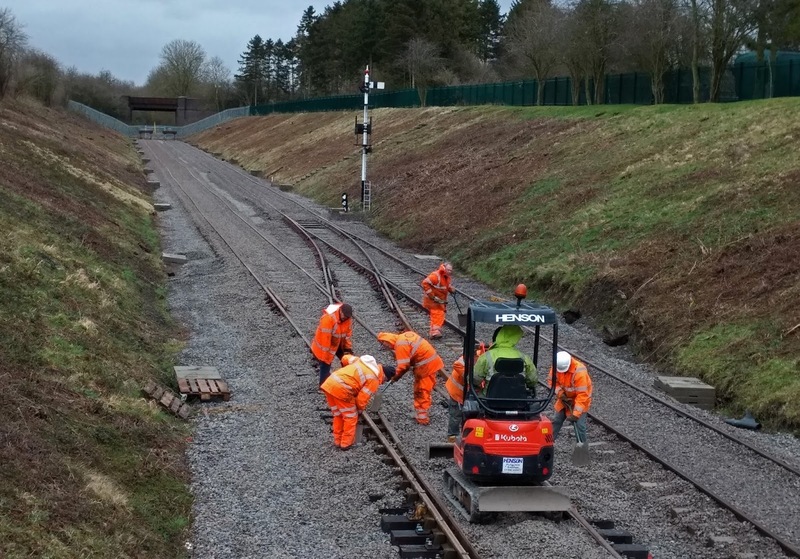 - There are still a number of minor jobs that need sorting - final track position adjustments, exchanging fishplates from temporary to final, installation of the two barrow crossings etc. - They may look nice on P1, but they are now missing on P2. A good dozen more tops will need to be found. Thanks Jo, another fine detailed report. 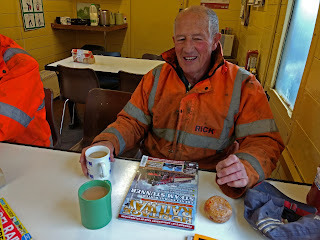 Jobs are certainly piling up for the PW Gang, that's three jobs I can almost recall, Broadway, Gotherington bridge and the points at Toddington South, it must be hard without Pauls Catering Coach stranded at the base in Toddington, is Mrs. B supplying other sustenance? Keep going though as only six weeks to go!! 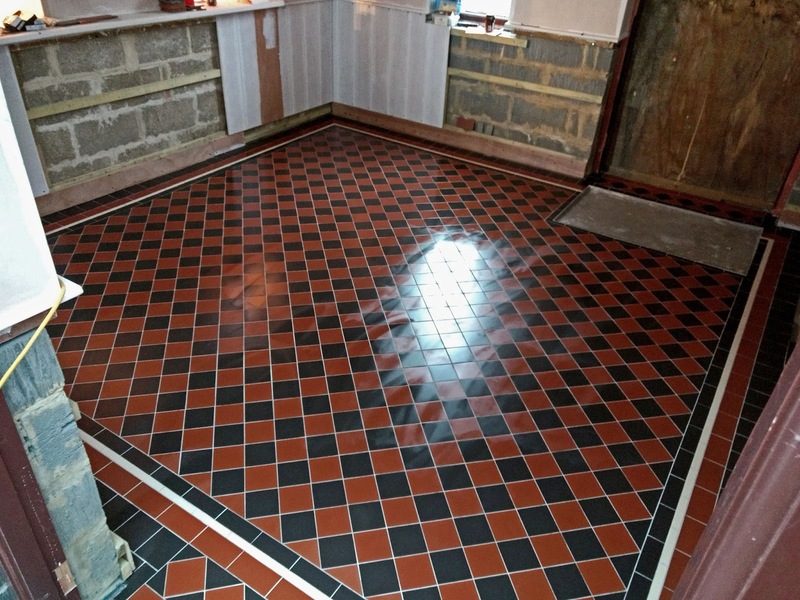 What a lovely finish on that floor. 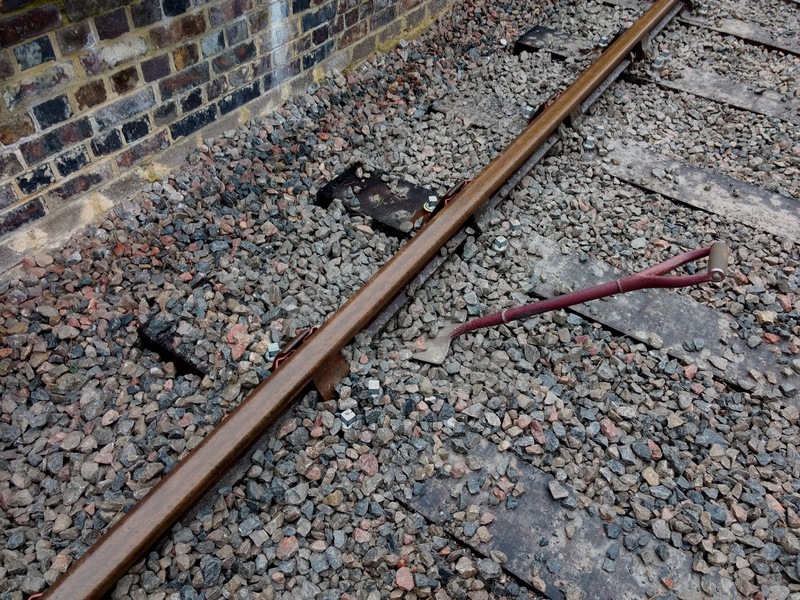 Presumably some brave volunteer has now to drill holes in it to fit the ticket barriers! Pardon my ignorance, the dogfish arrive loaded with ballast. 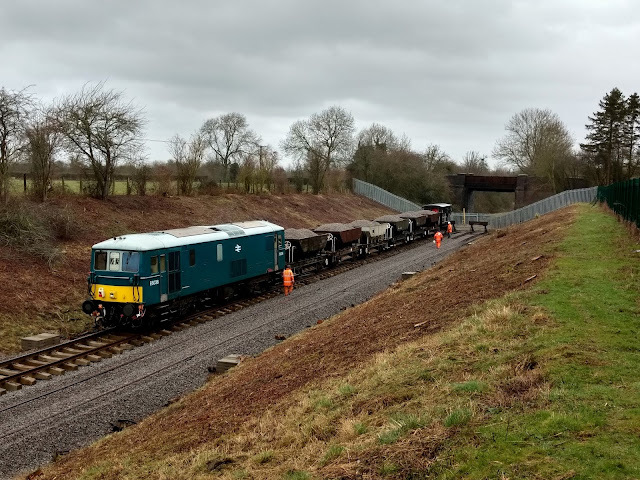 The ballast is distributed and the dogfish depart empty to return later loaded. Where and how are they loaded please ? An excellent blog thank you. Thanks for a prompt reply Jo.